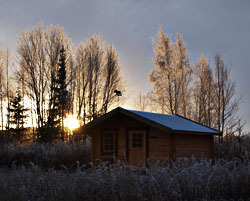 Nordic Husky Farm has cabin available for rent. You can stay on the farm in order to join one or more of our Outdoor Adventure Programs, or if you wish to extend your stay, you are more than welcome if the cabin is available. Make sure to book in time! You can also rent a place to stay if you are just passing through our area or want to plan your own holiday. There are many interesting places to visit and attractions to see in the neighbourhood. Visit the Useful Links to learn more about the area and it's offer. You are Welcome to Stay at Nordic Husky Farm! Make sure to book your place well in advance! Check for date availability. Pets Please note that pets are welcome, but must be kept on leash on the property. The area is very nice for walking with your dogs, but they must be kept on leash all the time. We also sell food, accessories and health products for pets and people.